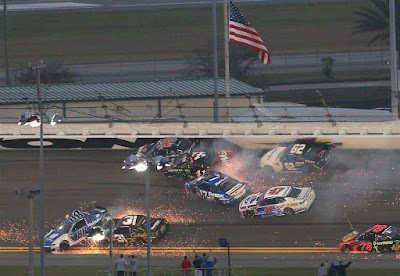 Daytona International Speedway Produced Numerous "Big Ones"
Just in case you had not heard . . . . . NASCAR is back! The three top National Series battled at the track known as the 'The World Center of Racing,' the Daytona International Speedway. On Friday, the Camping World Truck series started off the season. 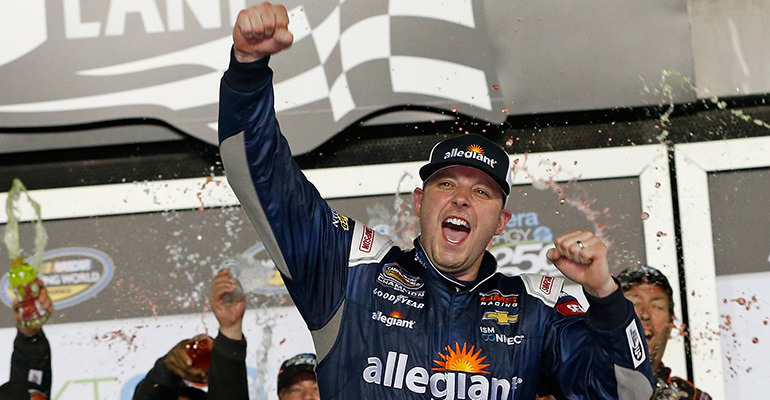 Johnny Sauter won the NextEra Energy Resources 250 at Daytona International Speedway, his third victory in the season-opening event for the NASCAR Camping World Truck Series. “This is the most unbelievable superspeedway truck I’ve ever driven. I felt like we executed flawlessly.” Sauter exclaimed. Tyler Reddick endured a flurry of late-race incidents and five “NASCAR Overtimes” to win the PowerShares QQQ 300 on Saturday. The season-opening race for the NASCAR Xfinity Series was scheduled for 120 laps (300 miles). By the time things wrapped up, a total of 143 laps had been run on the 2.5-mile tri-oval. Reddick, a rookie driver in the No 9 BurgerFi Chevrolet partially owned by Dale Earnhardt Jr., edged his JR Motorsports teammate Elliott Sadler (No. 1 OneMain Financial Chevrolet) in a door-rubbing photo finish. Officially, the margin of victory was listed as 0.000 seconds, the closest finish in NASCAR national series history. Two-time race winner Ryan Reed (No. 16 Drive Down A1C Lilly Diabetes Ford) finished third. “This feels amazing,” Reddick reported. “Helluva way to start the year off with JR Motorsports … and get my first win for JR Motorsports. Twenty years after Dale Earnhardt ended a career-long drought by winning the DAYTONA 500 in the famed No. 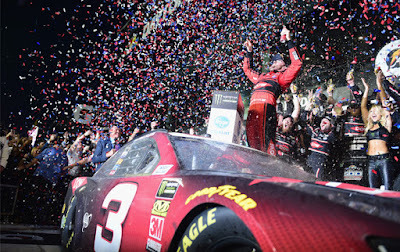 3 Chevrolet of Richard Childress, Austin Dillon – Childress’ grandson – returned the No. 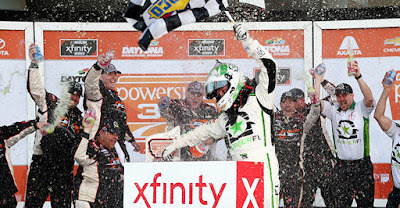 3 to Gatorade Victory Lane at Daytona International Speedway. 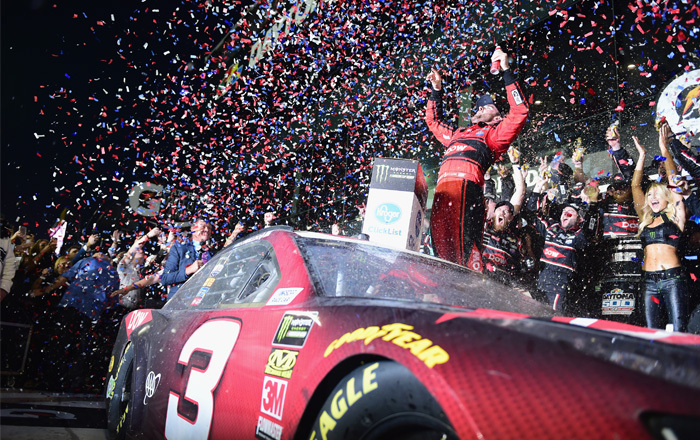 And he did it with a last-lap, bump-and-run move that was absolutely Earnhardt-like, to boot – in the 60th running of the season-opening race for the Monster Energy NASCAR Cup Series. As the lead pack approached Turn 3, Dillion – with a considerable aerodynamic push from the No. 43 Click n’ Close Chevrolet of Darrell “Bubba” Wallace Jr. – made a run in his Dow-sponsored car for the front but was blocked by Almirola. 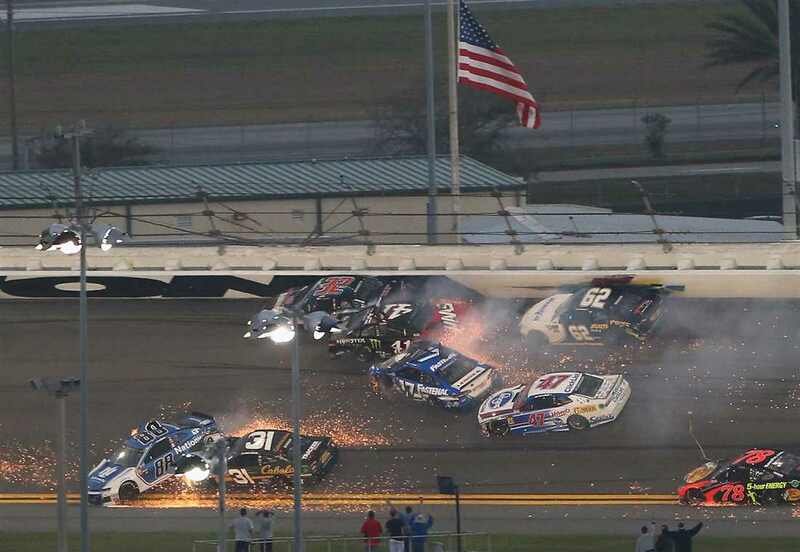 Dillon kept going, tapping the rear bumper of Almirola, which sent the Ford into the wall. Dillon and Wallace continued on to the finish line, with Dillon winning by 0.260 seconds. Denny Hamlin (No. 11 FedEx Express Toyota), the 2016 DAYTONA 500 champion, finished third. The celebration continued today for @austindillon3 and @RCRracing with this morning's #DAYTONA500 Champion's Breakfast!